When you read about acne or other skin diseases, you encounter words or phrases that may be confusing, such as comedo, papule, pustule, nodule and cyst, which are all various types of acne lesions. 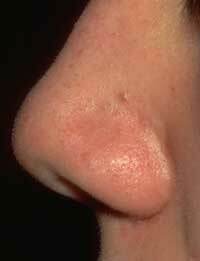 Close to 100% of people between the ages of twelve and seventeen have at least an occasional whitehead, blackhead or pimple, regardless of race or ethnicity. Many of these young people are able to manage their acne with over-the-counter (nonprescription) treatments. For some, however, acne is more serious. In fact, by their mid-teens, more than 40% of adolescents have acne severe enough to require some treatment by a physician. In most cases, acne starts between the ages of ten and thirteen and usually lasts for five to ten years. It normally goes away on its own, sometime in the early twenties. However, acne can persist into the late twenties or thirties or even beyond. Some people get acne for the first time as adults. 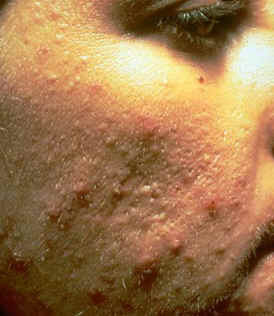 Acne affects young men and young women about equally, but there are differences. 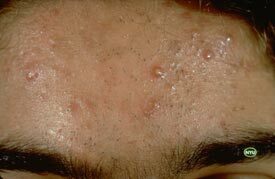 Young men are more likely than young women to have more severe, longer lasting forms of acne. 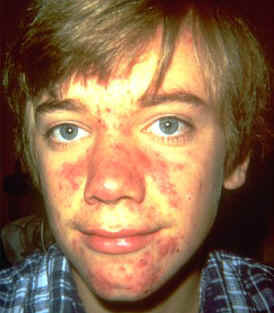 Despite this fact, young men are less likely than young women to visit a dermatologist for their acne. In contrast, young women are more likely to have intermittent acne due to hormonal changes associated with their menstrual cycle and acne caused by cosmetics. These kinds of acne may afflict young women well into adulthood. View Samples Acne also has significant economic impact. Americans spend well over a hundred million dollars a year for nonprescription acne treatments, not including the cost of special soaps and cleansers. There are also the costs of prescription therapies, visits to physicians and time lost from school or work. 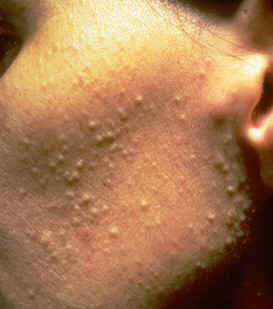 What are some myths associated with Acne? Myth #3: Acne is just a cosmetic disease. 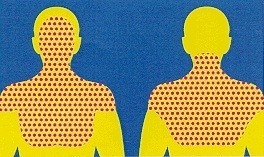 Yes, acne does affect the way people look and is not otherwise a serious threat to a person’s physical health. However, acne can result in permanent physical scars–plus, acne itself as well as its scars can affect the way people feel about themselves to the point of affecting their lives. Myth #4: You just have to let acne run its course.The truth is, acne can be cleared up. If the acne products you have tried haven’t worked, consider seeing a dermatologist. With the products available today, there is no reason why someone has to endure acne or get acne scars. A Dermatologist can provide you with all the options available today which include over-the-counter products, physical procedures such as light therapy and lasers, and prescription medications. You may feel awkward about seeing a dermatologist, especially if you’ve been told that acne is something you will eventually outgrow. To help you decide whether or not it’s time to consult a dermatologist, listed below are some statements. Do any apply to you? I have painful, pus-filled lesions (nodules) in addition to blackheads and whiteheads (comedones), and reddened spots on my skin. If you said “yes” to any of the above statements, seeing a dermatologist may be beneficial. Today, virtually every case of acne can be successfully resolved. Not only can dermatologists help resolve existing acne, they can also help prevent new lesions from forming and reduce your chance of developing disfiguring scars. Can a dermatologist help with the Acne Scarring? Yes, there are many procedures today that can effectively reduce or remove the appearance of scarring such as dermasanding, subcision, laser resurfacingand fillers. 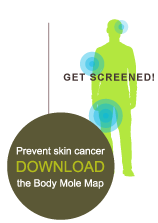 Your dermatologist can assess your scarring and advise you on which techniques or procedures can help you! For more information about Acne, go to http://www.skincarephysicians.com/acnenet/index.html __________________________________________ All photos and Information used with permission of the American Academy of Dermatology. National Library of Dermatologic Teaching Slides.